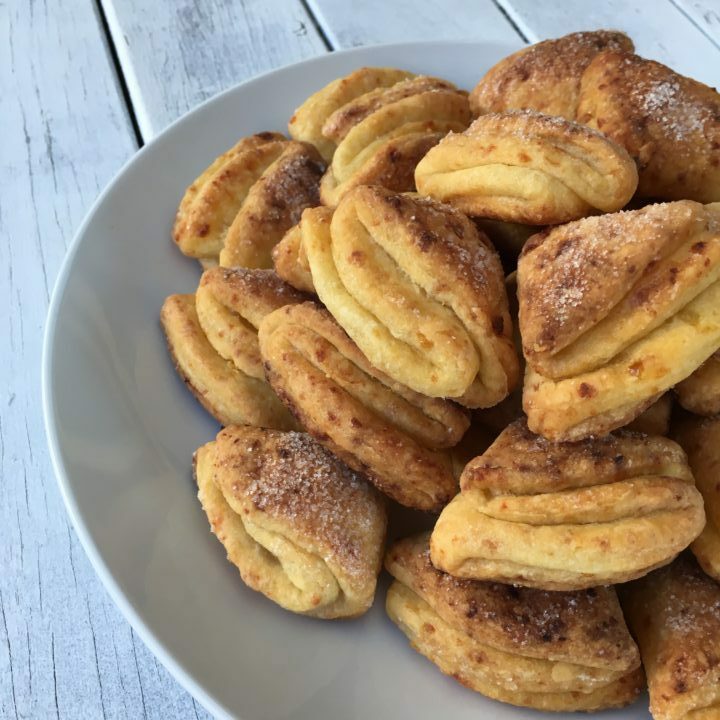 I came across the recipe for cottage cheese cookies while randomly browsing Latvian news websites. I had never seen it before and suddenly it was everywhere – sure we do make cookies with cheese, but cottage cheese? Latvian ingredients, my curiosity… Turns out they are very quick and easy to make and taste fantastic – light, crunchy, crumbly and not overly sweet. The batch yields around 35 cookies. Mix together cottage cheese and butter in a medium size bowl. Add sifted flour, salt and baking powder. Mix well. Knead the dough, add more flour until the dough does not stick to the hands. Place the dough in the bowl, cover and place the bowl in the fridge for 30-45 minutes. Remove the dough from the fridge, roll 3-5mm thick and cut out circles around 5cm diameter. Dip one side of the circle in sugar, fold over in half with sugar inside. Then dip one side in sugar and fold over again. Dip one side in sugar. Place on baking tray with sugared side up. Repeat until you run out of dough.